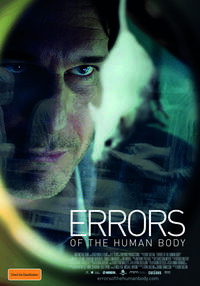 Errors of the Human Body, filmmaker Eron Sheean's feature length directorial debut, is all about questions and mysteries. Its characters are scientists trying to crack the secrets of mystery viruses and wonder genes. There's a mystery experiment going on in the basement. And as viewers, the film plays with us as to what kind of movie it is - horror film, science thriller, or personal drama. Unfortunately, in the case of most of these questions the film fails to provide answers interesting enough to make the journey worthwhile. American scientist Geoff Burton (Michael Eklund, looking like an emo Tom Cruise) has arrived in Dresden, Germany to continue his work after being forced out of his lab in the States. Geoff is haunted by personal demons - he's struggling to move on from his marriage's disintegration after his new-born baby died of a mystery virus (which he has since dedicated his career to curing), and salt is thrown in the wound when he hears his ex-wife has fallen pregnant to her new husband. Arriving for his first day on the job, Geoff learns from the Institute's Director (Rik Mayall) that he had an ulterior motive for luring Geoff to Dresden - Geoff's old flame Rebekka (Karoline Herfurth) has discovered a new gene which rapidly accelerates cell regeneration in amphibians, and they want his help working out how to introduce it into mammals. It's a discovery that promises medical miracles, but we fear danger is lurking in the dark when Geoff has a run-in with rival scientist Jarek (we know he's up to no good because he's completely hairless - it's that kind of movie). This sets off a chain of events that promises to boil over into a disaster that will show us once again humans play God at their peril. In an excellent costume party sequence at the mid-point, the film's eerie quiet is turned on its head as Geoff's skull-face make-up and the strobing coloured lights push proceedings into the psychedelic and ratchet up the tension as bubbling conflicts finally boil over. You can feel the film pulling between its roots as an exploitation movie (as in a dream sequence where mice explode out of Geoff's head) and a desire to be something more nuanced, but even this actually works in its favour, building suspense about what's going to happen. You can never get comfortable that you're watching a psychological thriller, sensing there's a possibility it may careen into an explosive bloodbath at any moment. The problem is, though, none of the above happens. Errors of the Human Body fails from a basic lack of story, failing to live up to its promises as either a horror or a thriller. The last major plot point happens at the end of the Act One, its consequences immediately predictable. You sit waiting for fresh twists to further compound our hero's predicament, but they never come. By the 3rd Act, the story has stopped completely. The shaky handheld camera tries to tell you this is fast paced and exciting, but it's not fooling anyone. The story has nothing left to offer, other than a last-minute reveal that fails to land with the impact the filmmakers' intend because the audience has emotionally disengaged long before. An unfortunate case of wasted potential, this mystery is ultimately an unfulfilling one.